General Motors has been reckless time and again with taxpayer money, turning roughly $80 billion in bailout money into a potential $16 billion loss on the backs of the American people. 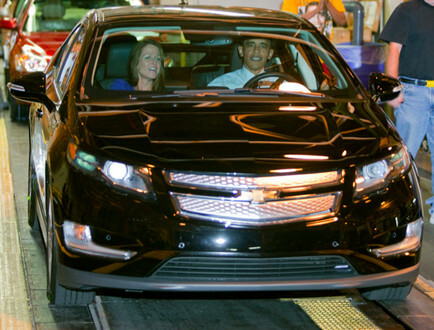 Then there is the official car of the Obama administration, the Chevy Volt, which has seen their production line shipped to China, and has garnered the Worst Flop of 2011 Award. The first problem I see with these electric vehicles is in the naming. Manufacturers need to start a line of more masculine vehicles. 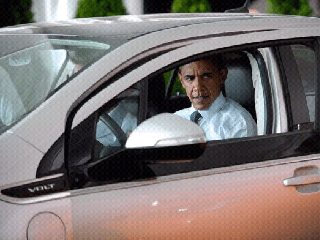 I would no sooner purchase a Chevy Volt, or a Nissan Leaf, than I would a Honda Cottonball, or Ford Baby Powder. “From the moment the bailouts began – and General Motors became Government Motors – we have seen GM stack failure upon failure. “GM in 2010 received more clean (non-energy) energy patents than any other entity – of the Solyndra,Tesla, Fisker, uber-failure variety. “And on, and on, and….